This Seat Ibiza Sport Coupe is available in Silver, Black, White, Red, Blue other colours and lease options, subject to availability and includes a warranty. The attraction of Seat’s Sport Coupe supermini centres on its good looks, keen pricing, low running costs, a decent amount of safety kit and relatively generous specifications. Unlike many other three-door variants, the Sport Coupe is really good value for money and comes with petrol and diesel engines. Beautiful car to drive and it doesn't cost the earth either. This Ibiza comes in 3 door and 5 door options. Which Seat Ibiza Coupe are you leasing today? We offer top quality Seat Ibiza Sport Coupe from brand new, nearly new, slightly used or ex demo, whether you have good or poor credit rating, pay a low or no deposit. These Seat Ibiza Sport Coupe can be leased or financed and come with a warranty, HPI checked and when contract hire leasing, include UK nationwide delivery and AA or RAC Roadside Assistance cover for peace of mind. Time4Leasing can offer you the latest Seat Ibiza Sport Coupe lease deals at lower prices because these vehicles are exclusive and offered at lower rates to customers that have good, poor or even bad credit history score ratings. The attraction of Seat’s supermini centres on its good looks, keen pricing, low running costs, a decent amount of safety kit and relatively generous specifications. Yet you can expect to get a great discount off the recommended retail price. There's a wide range of petrol and diesel engines for Ibiza buyers to pick, from the three-cylinder petrol to the sporty 2.0-litre diesel. There are different suspension set-ups to choose from, too, but the Ibiza just isn’t as fun to drive as rivals such as the Ford Fiesta. However, most models get a decent amount of standard equipment that puts some manufacturers to shame, while safety features include twin front and side airbags. The Ibiza has scored a maximum five stars from Euro NCAP for crash protection. 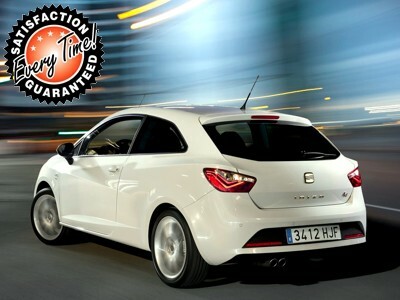 There are 47 Seat Ibiza Sport Coupe Lease Deals on Offer.